Although Seattle’s cityscape is most recognizable beneath a stormy fog, the Emerald City is made up of so much more than its oft-inclement weather. 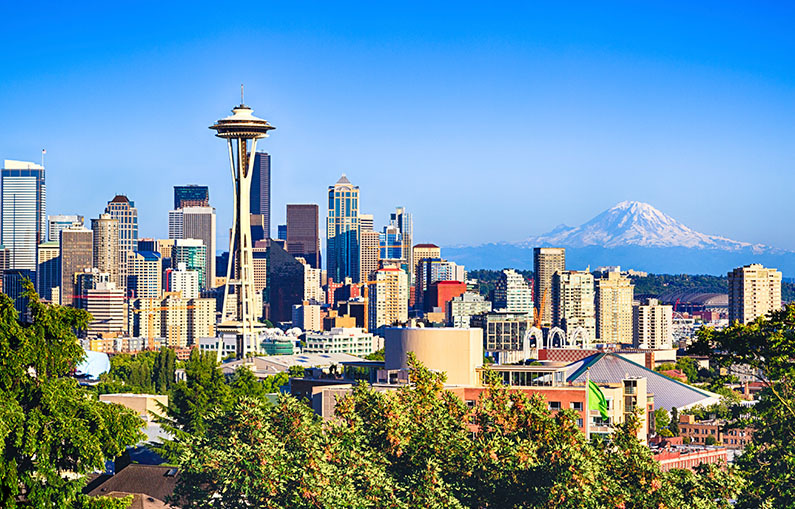 With a thriving tech industry, a longstanding commitment to great coffee, and a stunning habitat atop the Puget Sound, Seattle is the place to be in the Pacific Northwest. No trip to Seattle is complete without a stop at Pike Place Market. The Space Needle notwithstanding, Pike Place is likely the most recognizable tourist attraction in Seattle, and with good reason. Wander through this massive market and stumble upon antique dealers, gorgeous produce, and kitschy family-owned restaurants. On the upper street level, seafood lovers can rejoice (and also participate in the Pacific Northwest tradition of fish mongering). Bring a piece of bubblegum and post it to the “Gum Wall” outside—Seattle’s known for this eclectic (sticky) tradition. An exhibit of the Seattle Center, the Chihuly Garden and Glass is a stunning showcase of glass-blown sculptures by the revered artist Dale Chihuly. The exhibit’s design is vibrant, with certain portions resembling the illustrations of Dr. Seuss or the world of Alice and Wonderland. Spend a day getting lost in the rainbow of his collection, the fantastic whimsy a comfort to an imaginative mind. If you’re looking for a truly unique way to experience Seattle, look no further than the tours offered by Bill Spiedel’s Seattle Underground. Following an adept tour guide’s lead, groups travel beneath the streets of the eccentric city. With a kooky assortment of attractions to gawk at along the way, visitors can get to know Seattle (literally) from the ground up. The passageways once served as the main roadways of the city; today, they serve as a gateway to Seattle’s character-laden past. After braving a trip to the top of the Space Needle, don’t forget to stop by the Experience Music Project Museum, a Seattle treasure dedicated to contemporary music culture. In the birthplace of grunge, visitors can peruse the world’s largest collections of artifacts from Seattle-bred musicians like Kurt Cobain and Jimi Hendrix. With a wild architectural design by Frank Gehry (it’s unmissable at the top of the Needle), the museum also hosts a Science Fiction Hall of Fame. To plan your trip to Seattle or for an extended guide of things to do, visit the official Seattle city guide at http://www.seattle.gov/visiting-seattle.